The Amazing Grace Baptist Church has organized a good old fashioned Christian tradition for Halloween: their annual "Halloween Book Burning." But don't expect to go and roast marshmallows, it is only for church members and those with personal invitations from the crazy pastor. 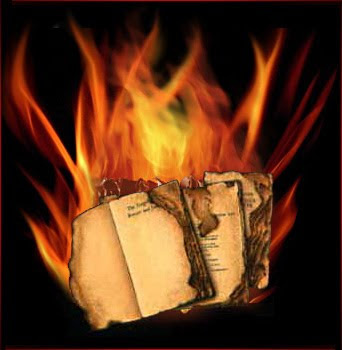 They want to burn "ungodly" books and their list is a long one, including most translations of the Bible, which they call "Satan's bibles." In there view the only legitimate Bible is the King James Version. Apparently God has only one correct version of his word and he needed a gay British monarch to arrange it for him. The church also will be burning "Satan's music" which includes the following: "country, rap, rock, pop, heavy metal, western, soft and easy, southern gospel, contemporary Christian, jazz, soul, oldies but goldies, etc." That "etc." category sound interesting. Sadly, the secularists, humanists, liberals and atheists are preventing a good old fashioned heretic burning. So they will have to limit their fun time to the burning of books and music. As compensation for such a restriction on their "religious freedom" they are promising "fried chicken, and all the sides." You just know this good ol' boy is yearning to burn a sinner. posted by blog owner at 10/30/2009 05:24:00 AM DiggIt! Reddit Del.icio.us Slashdot It!